The central Asian republics remain something of a mystery to European travellers. While Afghanistan and Pakistan might be familiar, at least on a map, few can differentiate Kazakhstan from its neighbours Kyrgyzstan, Tajikistan, Turkmenistan and Uzbekistan. Coming in to land at Astana International Airport during a visit earlier this month, it was easy to get lost in the rolling steppes of the country – there is literally nothing for miles. 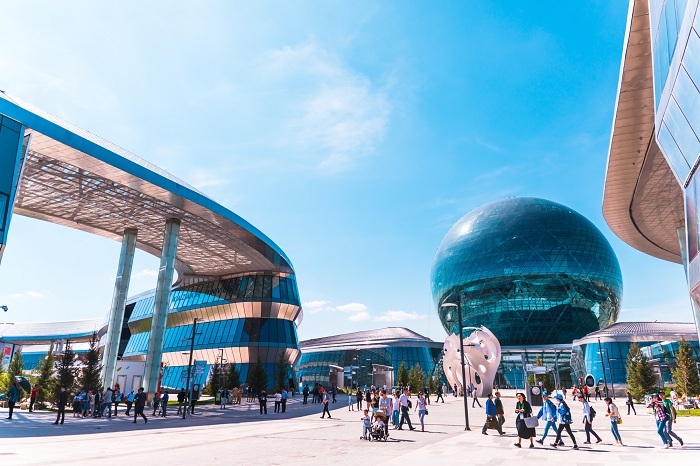 Expo 2017, Astana - an international fair focused on the theme of ‘Future Energy’ – is an attempt to rectify this, to put Kazakhstan on the international map. By far the largest country in the region, though with a population of just 17 million, the destination is focused on the twin cities of Almaty and Astana. Almaty, long considered the cultural capital, is home to world-class skiing and a well-developed tourism infrastructure, meaning it has previously been the star of the show. It is also penned in by the surrounding mountains, however, making growth difficult, while earthquakes are common. This has led to focus shifting to Astana in recent years, with Expo 2017 something of a coming out party for the city in this regard. As many as one, three, or five million visitors are expected to pass through the gates, depending on who you ask, before a closing party in September. Some 15 per cent of these guests are also expected to travel internationally. Upward of 40 countries have been offered visa free travel to the show as a result, while an international marketing campaign has been pushing the event up the global agenda. Astana is a glittering capital - think ‘Soviet Dubai’ - just waiting to be discovered. There is already plenty to see in the city, from the Baiterek Tower observation deck and Hazret Sultan Mosque, to the more modern Khan Shatyr (a giant temperature controlled tent-like structure) and Palace of Peace & Reconciliation. Indeed, for convenience, all the major sites align along a single unifying axis through the city, centred on the presidential palace. As for the expo itself, a huge new site has been built, at a reported cost of US$5 billion (though firm figures are hard to come by), towering over the skyline to the south of the city. Daniel Serzhanuly, chief manager, tourism and development department, Expo 2017, explains: “Kazakhstan is a young country and it is important for us to get our message out there, Expo 2017 is part of that. “We are far away from some of the major source markets, so this is an ambitious project for us, and its success will be a significant achievement. 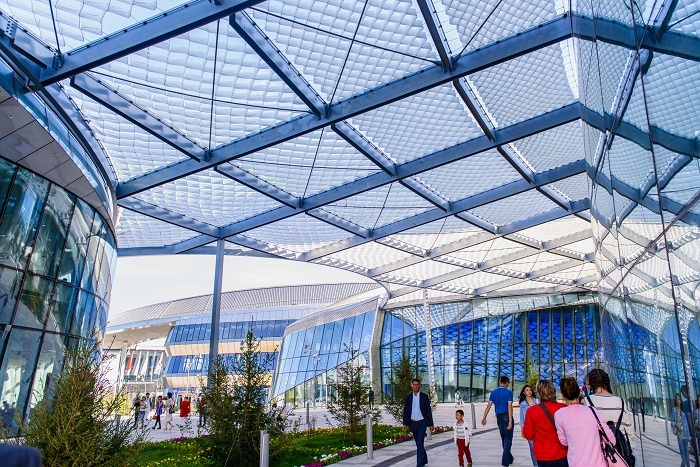 If nothing else, Expo 2017 is an architectural marvel. Representatives from over 100 countries are participating in the show, each housed in buildings arranged in a concentric pattern emanating from the centre of the site. At the heart of it all is the huge Kazakhstan pavilion – a huge orb like structure dominating the show. Tickets are priced at 4,000 tenge for a day, making it possible, if not affordable, for locals, while a multi-day pass, allowing unlimited visits, if you should wish, is available for 50,000 tenge. Walking through the site a week or so after opening it is impossible not to be impressed. Gleaming steel and glass buildings stretch effortlessly into the distance, while the immaculate site was apparently completed on time. The main objective is to call for sustainability in energy creation, to foster a discussion and to develop knowledge enabling people to control energy consumption. At least, that is what the press materials say. On the ground it is in little evidence, with children running through fountains, ice cream being sold and various pavilions taking turns to present loud national bands. It is more of a day out for the family that a serious examination of global climate conditions. Tourism in Kazakhstan is either hugely underdeveloped or possess vast potential, depending on your view point. Around four million international visitors arrived in 2016, with a large proportion drawn from former colonial master Russia, as well as significant groups from Uzbekistan, Kyrgyzstan, South Korea, China and Turkmenistan. Air Astana - the national flag-carrier launched at the turn of the millennium – has been doing its part to rectify this. The carrier has been connecting new destinations to Kazakhstan – most recently Kiev, Delhi, Seoul, Tbilisi and Bangkok – as it seeks to build a sustainable global network. While it is increasingly looking at transit traffic to make the numbers add up, Air Astana also offers a comprehensive stopover programme, letting guests stay the night for as little as $1. But when you consider each tourist to Kazakhstan spends $1,500 – you can see why the government is keen for the sector to grow. With the price of oil remaining stubbornly low, this desire for more international visitors will only grow further. 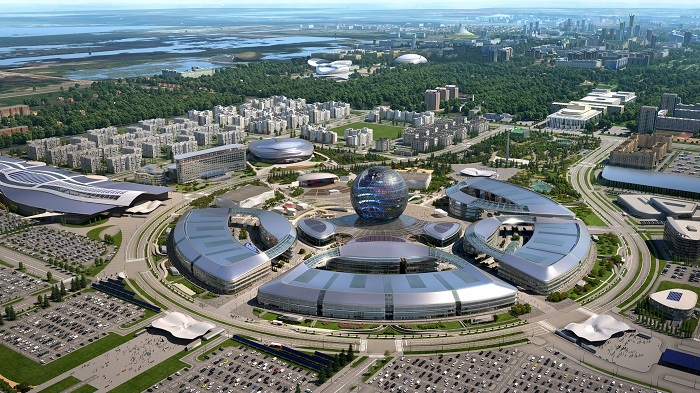 Of course, Expo 2017 is somewhat of a gamble for Kazakhstan. To reach expected attendance numbers roughly one third of the country would have to visit at least once – no small feat in a country the size of Western Europe. As for the expected 750,000 international visitors, this might prove to be a bridge too far. During a recent visit, there were plenty of locals taking a stroll through the expo site, but not much evidence of international traffic. And while the Kazakhstan booth – the orb ominously towering over proceedings – was packed with day-trippers, many of the smaller pavilions were as good as deserted. The exorbitant costs can also be questioned in what is still a developing country. 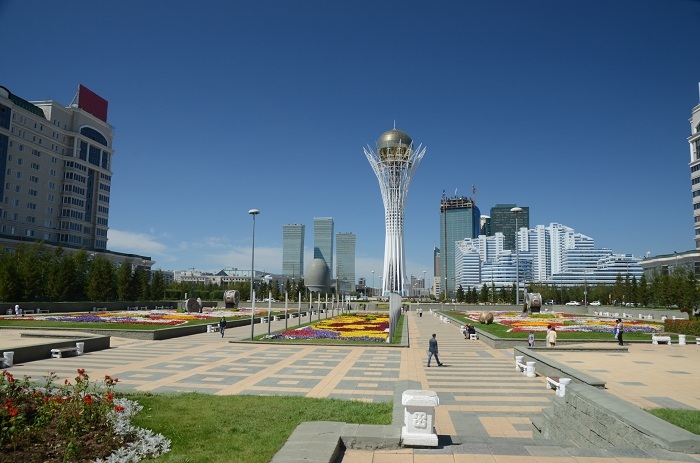 Under the dictatorial leadership of president Nursultan Nazarbayev, in power since the collapse of the Soviet Union, the destination has certainly developed quicker than its regional rivals. But it is unlikely the public will have had much say on whether to invest the country’s developing wealth on what could turn out to be a very expensive white elephant. Plans are in place to turn the Expo 2017 site into university facilities and a regional financial hub, but both might be a stretch given the city has a population of just over one million. But Kazakhstan is nothing if not ambitious – Expo 2017 could be the start of a meteoric rise or an expensive lesson in hubris. Air Astana operates a fleet of 31 western aircraft with an average age of 7.84 years. It operates over 60 domestic and international routes. Its passengers are served by more than 4,700 highly qualified staff, the majority of whom are from Kazakhstan, supplemented by experienced foreign personnel. Since autumn 2005 the Air Astana team has been headed by Peter Foster, an airline executive with more than 30 years of management experience. These will expand the fleet to 33 aircraft by the end of 2017, and to 43 aircraft by 2020. Find out more on the Air Astana website. To find out more about visiting Kazakhstan head over to the official website.